The run up to this game saw an unnecessary frenzy for United fans caused by Aston Villa over match tickets. Villa had put the tickets on open sale over the internet about five weeks ago, just like they’ve been doing for years, only this time, they rescinded the tickets bought by anybody they suspected of being a United fan. Through a friend who has lives in the middle of Liverpool, I’ve been getting tickets for Villa in this way for a while now and I have never seen any problem at Villa Park when United have been in the Villa part of the ground. I always thought Villa were grateful for the revenue visiting reds gave them, I was wrong. This time, Villa tried using the United game to sell half season tickets. You’re not famous anymore indeed!! While Villa had a cull of people buying tickets for the game, they didn’t fully succeed. There’s nowt more resourceful as a travelling United fan* (please see the bottom) getting into the match. When Radamel Falcao equalised in the 52nd minute, there was a slew of reds in the Villa section next to the segregation line, who started celebrating the goal. This wound up a nearby crew of stewards to such a degree that I am now convinced (having been there many times) that they are compulsorily prescribed amphetamines before United’s fixture at that ground. It’s either that or they’ve watched too many films about American soldiers in Vietnam. If they are sane then I know where there’s a house full of people like them. The lad who had his Steve Gerrard banner stopped at Old Trafford last week on Health & Safety grounds was told today to not pull it out under any circumstances. This was at exactly the same time that a huge banner was being unfurled across the Holte End in a forlorn attempt at rousing some passion out of Villa fans. Unlike last week though, the Gerrard banner was briefly seen on live television worldwide, seconds after Falcao’s goal. Shall We Fill Your Ground For You? 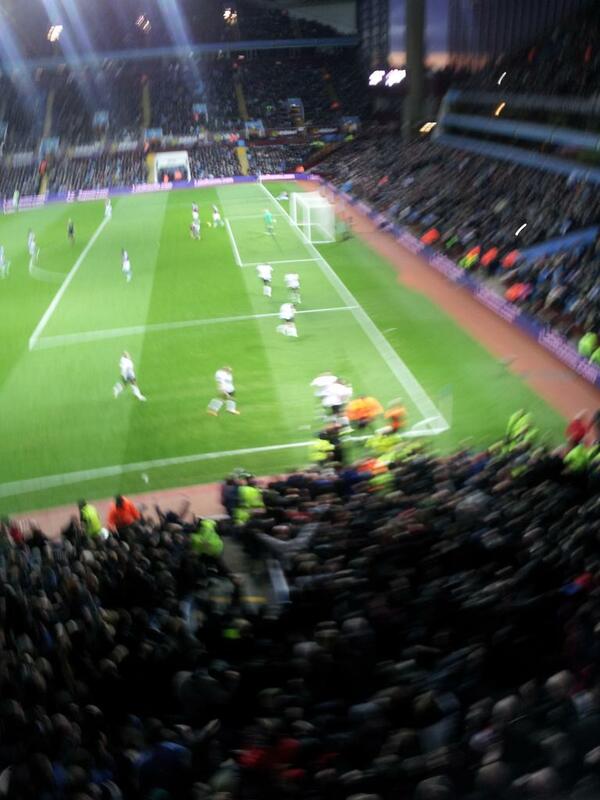 The irony of Christian Benteke putting Villa in front in the 18th minute should not be lost on any red. United have done a few smash ‘n’ grabs lately and now with this, Villa’s first attempt on goal, United had fell victim one themselves. There was no other threat from Villa in the first half but early in the 2nd half, Benteke forced a great save from David de Gea. There has been a fair amount of disquiet about Radamel Falcao recently. Once the initial excitement of his signing had calmed down, he’s only scored two goals since his loan was confirmed on Transfer deadline day (© SKY Sports News). He hasn’t had a great return of goals but the two goals he has scored have been worth four points to United. When he was allowed a free header from six yards soon after de Gea’s save, a centre forward of his quality was never going to miss an opportunity like that. That the cross for the goal was provided by Ashley Young, relentlessly booed all afternoon by the half wits that occasionally populate Villa Park, made the goal even sweeter. In the 64th minute, Gabriel Agbonlahor was harshly sent off by Lee Mason for a challenge on Ashley Young that was in my opinion, a yellow card. The fact that it was a foul on Ashley Young which had resulted in the red card, caused an apoplectic reaction from the Villa fans. The local Police must’ve been relieved Ashley Young didn’t score the winner, even though that was what the more mischievous reds were praying for. I reckon they could have had a repeat of the Handsworth riots on their hands, just in time for the festive period. At the full time whistle, we walked away with a 1-1 draw, probably a fair result. I now know that Louis van Gaal, Michael Carrick and Wayne Rooney have expressed disappointment that United didn’t win. I’m disappointed too, especially playing against ten men for nearly half an hour but United have had some good luck in recent weeks so I just go with it. We could be far worse off. Think of last season. What this result will hopefully do is calm a few people down. Some of the garbage I’d read in the media after the Liverpool win was understandable in that they were doing their job. Winding up the more gullible amongst United fans. What has surprised me was how may people got wrapped up in that excitement. Sure beating Liverpool and Arsenal over a six game run are great results, it doesn’t meant that United are suddenly in serious contention for the title. I knew today boded well when word got out just before kick off that Leeds United had lost 6-1 at home to Watford. It doesn’t matter where that club is in the League pyramid, to hear that they’ve not only lost but have been annihilated is always very gratifying. Leeds could be at the bottom of the lowest league possible and it still would be too exhalted a position for me. I later hear that Mikel Aterta missed a last minute penalty as Arsenal drew 3-3 at home to Fulham. I wonder if Arteta was accosted by Fulham players the same way that Ruud Van Nistelrooy was by gloating Arsenal players like Lauren, Ray Parlour, Martin carthorse Keown and Ashley Cole (hiding behind Sol big boy Campbell) in 2003?